a rather unusual chinaman: Support Macmillan Cancer, by eating cake! 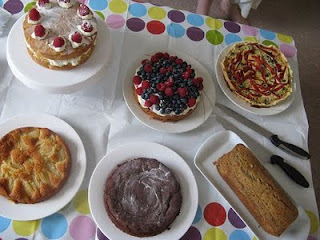 Support Macmillan Cancer, by eating cake! Just a mini post from me but a worthy one nonetheless. Macmillan Cancer Trust are a British charity supporting cancer victims and their families. As one of their initiatives, they are encouraging people to hold coffee mornings, filled with cakey goodness and give a small donation in return. The main "Coffee Mornings" are to be held in 2 weeks but this event was to try and raise some awareness for Macmillan Cancer Trust, so hopefully you reading this has at least done that. If your feeling generous, you may even want to donate a few pennies (please do so here!). And finally, thanks to the host for a great spread and a really fun afternoon. Please visit her write-up for more info and some great recipes.